Description: These Grip Extensions replace the magazine base plate and retain all other factory components. They do not alter the capacity of the magazine providing better comfort and control by adding approximately 1/2 inch of gripping surface. 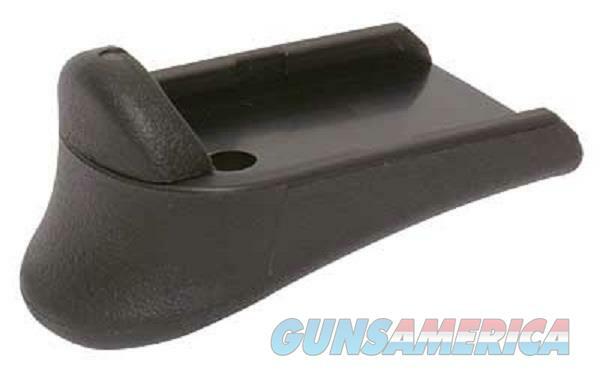 An optional filler piece is provided for Glock models with a semi-circular cut-out in the lower front area of the grip body. This filler piece allows for installation of the PG-19 on all Mid and Full Size Glocks. NOTE – Full metal lined magazines only. · These units blend with the contours and texture of the handgun giving a factory appearance. · They are made from High Impact Polymer and withstand drop tests at temperatures from -20 F to 350 F.
· They form the next logical finger positioning feature to provide control and comfort without sacrificing conceal ability. · Provides magazine identification via Mag-Track™ for those that rotate magazine usage.